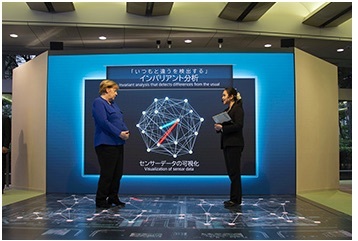 TOKYO, Feb, 06 2019 - (JCN Newswire) - NEC Corporation (TSE: 6701) has announced that German Chancellor Dr. Angela Merkel visited the company's Tokyo headquarters on Tuesday, February 5, where she was introduced to NEC's advanced ICT technologies, including AI and biometric identification solutions, and engaged in dialogue with employees about technology, regulations and privacy protection. 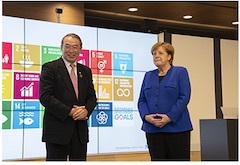 Chancellor Merkel toured the "NEC Future Creation Hub," a newly established co-creation space at NEC headquarters, as she was hosted by NEC's Chairman of the Board, Nobuhiro Endo, and a wide range of NEC employees on her only visit to a private company during this trip to Japan. NEC also introduced AI and biometrics use cases as part of illustrating the value that they provide to customers, in addition to the demonstration of a satellite-mounted radar system for monitoring urban infrastructure, the integrated management of various sensing data, disaster prevention and disaster countermeasure solutions. This was in addition to an active discussion between Chancellor Merkel and NEC employees on the application of ICT for helping to resolve social challenges. "It was an honor for NEC to host German Chancellor Merkel, who plays a leading role in the promotion of international cooperation and development between governments and business," said Chairman Endo. "It was extremely meaningful for NEC to discuss with Chancellor Merkel issues related to value creation throughout the world, in addition to highlighting our latest solutions. Following this meeting, we look forward to promoting NEC's cutting-edge solutions for safety, security and social value across Germany and abroad." Tour of the "NEC Future Creation Hub"